A Numbers Game did some interesting work on the side bias of various college topics, here, specifically, controlling for team strength. In that spirit, I decided to use a different method and see how the results compared. The third column shows the mean of the matched pairs computation: for each team, I subtracted its negative win percentage from its affirmative win percentage, and I averaged this score over all the teams that year. The fourth column shows a calculated (not the actual) affirmative win rate. They compare closely to the actual rates A Numbers Game already found. The two that are highlighted differ slightly. The affirmative win rate for the China topic my analysis suggests is slightly lower than the actual rate. The affirmative win rate for the courts topic my analysis suggests that the negative had an advantage, while the actual rate showed an affirmative advantage. The blue line represents a normal CDF, given the population's ('08-09) mean and standard deviation. Anything below the line on the left or above the line on the right is tighter than normal. The reason is that the standard deviation is pulled way out by the teams that competed for few rounds (who had very high variability in the spread, from -1 to 1). For '08-09 for example, the standard deviation for the whole population is 0.31; excluding teams with fewer than 9 rounds experience, 0.22. 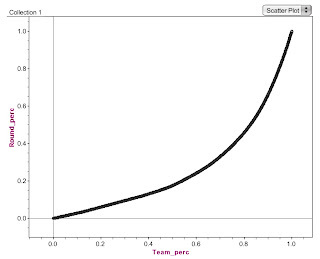 The top 5% of teams debated 19% of all rounds. 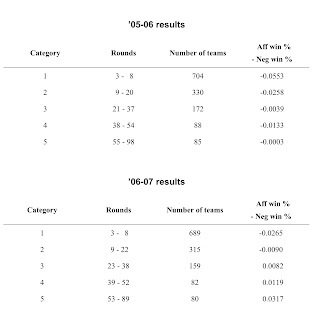 The top 10% of teams debated 34% of all rounds. The top 20% of teams debated 54% of all rounds. The top half of teams debated 83% of all rounds. Because of the heavy weighting of rounds debated by less active teams compared to rounds debated by more active teams, I'm not sure how you did your statistical test. Do you expect the aff win percentages to follow a nearly normal distribution? I'm not sure that would be justified, given the number of teams with with few rounds. I used a 1-sample t test. My thought is that the sample has less variability (because of the very experienced teams) than the calculated s.d., which means that the confidence levels are too low, not too high. Or do I have that backwards? As I understand it, the t test expects the sample to be normally distributed. I don't think it is valid otherwise. What do you mean "less variability than the calculated s.d."? What is "variability"? Is it the same as variance? Which calculated s.d.? The sample standard deviation of the side win percentage difference? The variance of the sample of aff win percentages is probably decreased by the teams with a large number of rounds. I think this doesn't make the t test accurate. It will, I think, make the expected distribution less normal. I might be wrong, but I don't think you can do a t test as an underestimate of statistical significance of a non-normal statistic. Thanks for the clarification above. I think I wasn't very clear in expressing my concern. I wasn't convinced that even the expected (rather than the actual) distribution of the statistic "per-team difference of aff and neg win percentages" would be normally distributed. 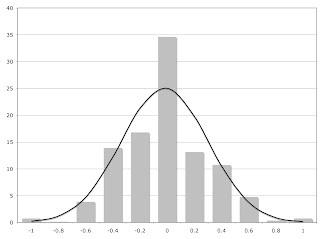 Whether the expected distribution would be normally distributed or not, the actual distribution is very close to normal, so a t test seems like a pretty good way to check for side bias. Another question your analysis inspires me to ask is "Who debates many rounds?" Is it only the best teams? 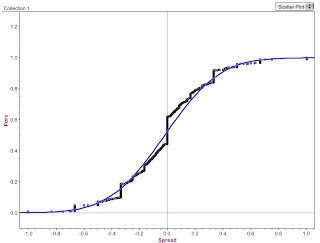 What does the Lorenz curve look like? What if you correct for elim depth, or geography, or budget? Do good teams at schools that already have a few better teams get fewer rounds because they don't get to travel as much? Would those teams get more rounds if they went to a school wither a weaker program? Fascinating questions. I went ahead and added a Lorenz curve. I haven't done the other analyses yet, but they are very interesting.